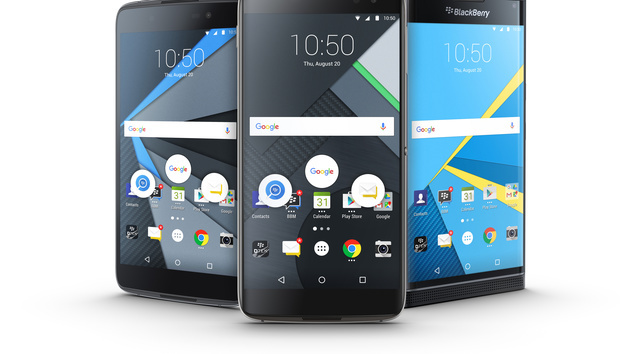 BlackBerry is back with another Android phone. This time it’s the DTEK60, the pricier sibling to the DTEK50 announced in July. This model offers better specs and comes in at $499, compared to the more modest $299 DTEK50. For the money you get a Snapdragon 820, 4GB of RAM, a 3000mAh battery that promises to go 24 hours, 32GB of internal storage, and a microSD card slot. The screen comes in at 5.5 inches with a 2560x1440 resolution at 435 PPI. As for cameras, the back shooter is 21MP while you get 8MP on the front. You’ll also see phase detection autofocus and dual LED flash. The phone uses USB-C for charging and data transfer. One neat trick is a “convenience key” located on the back of the phone, which BlackBerry says will give quick access to your most-used apps and tasks. A fingerprint reader is also included on the back. Software is the real star here, as BlackBerry has farmed out its hardware operations to focus on security solutions that will appeal to business users. The company says the phones offer Android “amplified” with features like a secure boot process, Android OS hardening, and full disk encryption. While the DTEK60 comes with Android Marshmallow, BlackBerry touts that it’s nearly as fast as Google about pushing updates. So you should see pretty rapid monthly security patches and should expect Nougat at some point down the road. You can buy the phone unlocked directly from BlackBerry. The story behind the story: The BlackBerry Priv was the last hurrah from the company’s own hardware efforts. It was a solid phone and did a good job with the physical keyboard, but at $700 it couldn’t compete with other flagships. The more modest DTEK line might have some more to offer as BlackBerry can focus on security as others focus on designing handsets (the DTEK50 was based on the Alcatel Idol 4).